The outhouse may be a thing of the past, but in Rantoul, Illinois outdoor toilets are reentering the scene. Residents of the town are waking up and finding these ceramic fixtures out on their front lawns, according to the Rantoul Press. Amazingly, these pieces generate cashflow every time they land at a residence. How can a toilet make money? You may wonder what makes a toilet in someone's yard a cash cow. According to the source, the youth group at the Rantoul First United Methodist Church created this bathroom-based fundraiser, called "Pass the Porcelain." The donations of this mission work in a few ways. 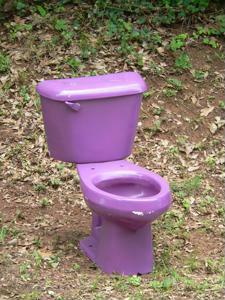 First, a donor pays for the toilet to be placed on someone else's yard. Once this friend or neighbor finds the fixture waiting outside his or her front door, they have a choice - either donate $15 to have the toilet removed or $25 to have the piece taken from the yard and planted in the yard of his or her choice. Residents who either want to make a big donation or keep their lawns toilet-free can buy "insurance" by donating $35, which then ensures that no one can put a fixture on their property. "The support from the community, not only from our Methodist church members but from other people helping out [has been great]," said Pat Button, leader of the youth group. Well, not in the normal sense. However, according to the source, residents of Rantoul have found ways to enjoy their temporary outdoor installments. Some people use the toilets as places to sit and contemplate quietly. Others read the newspaper atop these thrones. For fun, some people have filled the toilet bowls with candy or flowers. The fixtures, normally reserved for the privacy of one's bathroom, have become a zany way to raise money. Plus, Button tells the source that he's put on some muscle since the charity started. Does the open-air quality of these outdoor toilets sound refreshing? They may seem like a staple of yesteryear, but outdoor bathrooms aren't completely dead. Houzz recently highlighted an outdoor bathroom, which included an old-fashioned bathtub, a shower head attached to the outer brick wall and robe hooks next to the glass-paned doors going into the house.